New: Knockout Game in Los Gatos. Knockout Game in Los Gatos. If you are counting, that is two cases. And if someone can tell me where Los Gatos is, I would be grateful. New: Knockout Game Denials continue .. Baltimore. Oakland. etc. Knockout Game Denials continue .. Baltimore. Oakland. etc. Call it whatever you want: The Knockout game. Polar hear hunting. Wolf packs. Black on white crime. Black mob violence. Whatever: New reports of racial violence from New Haven, Baltimore, Philadelphia, Salisbury, Milwaukee, Oakland, Minneapolis, Brooklyn, Antioch, and other places are coming in faster than reporters can wish them away. No matter how much the Society of Professional Journalist tries otherwise. No matter how many members of the National Association of Black Journalists want to convince us differently. Even Al Sharpton admits the attacks are real and “racist.” Which is more than the New York Times, CNN, USA Today and others are doing. The Yale Daily News, America’s oldest college newspaper, reluctantly reported seven recent episodes of the Knockout Game in and around the New Haven campus in November. Not once mentioning all the assailants were black and the victims were not. Not once mentioning the New Haven is a center of black mob violence directed at students and staff of Yale — last summer two doctors were assaulted in racial violence, one losing part of his ear. WND has documented more than a dozen other cases of black mob violence in New Haven, including this roundup. Black mobs erupt in Ivy League region. That even was before the “All Black Affair” party in October, where 500 black people fought with police, destroyed property, and rampaged through three New Haven establishments. No one was arrested. Whatever is(not) happening, the paper did find time to report it has been like that for a long time and everyone knows it because they live in an “urban environment,” said one Yalie. “ABC2 talked to victims months ago, before the “knockout game” was a national buzz phrase. Back then, leaders wouldn’t talk to us because they weren’t aware of the problem. Now they won’t talk because they don’t want it to become one here in Baltimore. “Jonathan Lomaskin spent the summer battered, beaten up and broken. “I had a complete fracture. Basically my lower mandible was fractured in half and all these teeth rolled inward,” Lomaskin said. The Mayor of Baltimore, Stephanie Rawlings-Blake, is one of the political leaders who is not talking about the Knockout Game. This is in contrast to her eagerness to talk about the killing of Trayvon Martin and subsequent acquittal of George Zimmerman. Many of the stories about the Knockout Game hoaz are written by members of the National Association of Black Journalists. The NABJ recently hosted the parents of Trayvon Martin at its annual convention. Not only did they invite Trayvon’s parents to address these issues to a group of media professionals, separate panels and meetings were also held that provided further discussion on the direction black journalists should take with their coverage. New: Knockout Game in Milwaukee? Old news there. Now the attacks spread like wildfire: The latest from Milwaukee. New Haven. Salisbury. Is it the Knockout Game? Everyone wants to know. In Milwaukee, call it whatever, lots of people know they have a problem with black mob violence. 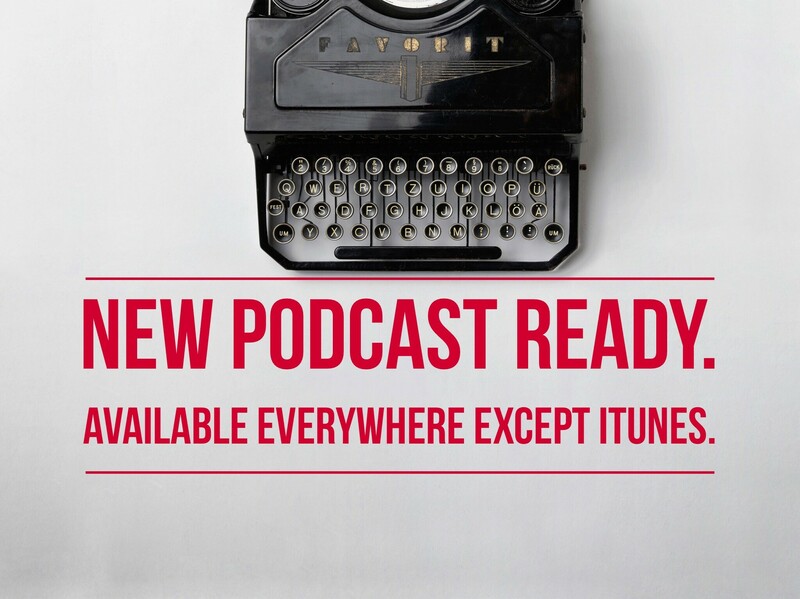 A preview of an article at WND. Links below. By itself, four black people in Milwaukee punching Tim Bessette in the face, knocking him out, breaking bones in his face, laughing and running away, does not constitute a national emergency. Not matter how badly he was hurt. No matter how much he insists he is a victim of the Knockout Game. It might not even be the Knockout Game — not the way the New York Times, CNN and other media define it. To most reporters — i.e. most of the people writing about how the Knockout Game is a myth — they imagine the game is played by a set of rules: Racially undefined teenagers get together and plan to punch someone in the face. If there is no planning, then there is no game. And never, never, never is race involved. That’s the way the suits in the news department see it. That’s not how the Knockout Game works. Most of the time the game is spontaneous. Sometimes the victim loses a wallet or an iPhone. Sometimes not. They always laugh. And 99 percent of the perpetrators are black. 99 percent of the victims are not. That is what people in journalism usually call a “trend.” But now call a myth. “I could hear them as they departed joking and laughing, Bessette told the NBC News affiliate in Milwaukee. The next thing he knew he woke up lying on the ground, in a pool of blood. From his hospital bed, he watched the national news stories describe the Knockout Game as a figment of some over heated imagination. But most people in Milwaukee are not talking to their local prison shrink. And if all they knew about racial violence in Milwaukee was what they read in the local papers, then it is easy to see how they might think black mob violence — including the Knockout Game — is a myth. Over the last three years, Milwaukee has been a center of racial violence and media denial. It is rarely reported. Seldom acknowledged in the press, but often the topic of conversation. Opinions are divided over which one was the worst: Was it the spontaneous violence of the state fair of 2011, where hundreds of black people beat and terrorized the crowds in and out of the fair grounds? Or was it the annual rolling race riot and black celebration known as Juneteenth? If so, what year? Violence is a regular feature of this annual downtown party. A lot of it on video. Some hold out for the Fourth of July. For at least three years, groups of hundreds of black people have done all sorts of bad things requiring police horses, helicopters and paddy wagons to bring it under control. Still others say the Mayfair Mall, where hundreds of black people rampaged through the retail area, causing shop owners and shoppers to hide behind locked doors, dial 911, and cower in fear as they begged police to hurry up. That’s on video too. And let’s not forget the random acts of racial violence in buses, street corners, shopping centers and other public places that are so popular on YouTube. 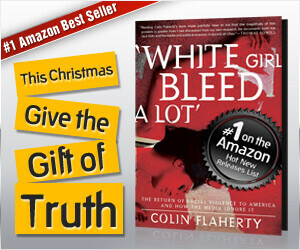 Many documented in White Girl Bleed a Lot: The Return of Racial Violence to America and How the Media Ignore it. 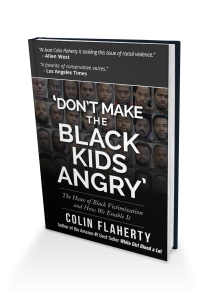 The title of the book comes from Milwaukee, Fourth of July, 2011: 50 to 100 black people rampaged through a local convenience store, looting candy and groceries. On video. They went to a nearby park where they met a few white kids and beat them up, badly. At one point, a black woman was standing over a white woman. She motioned to her accomplices to look down at the ground. 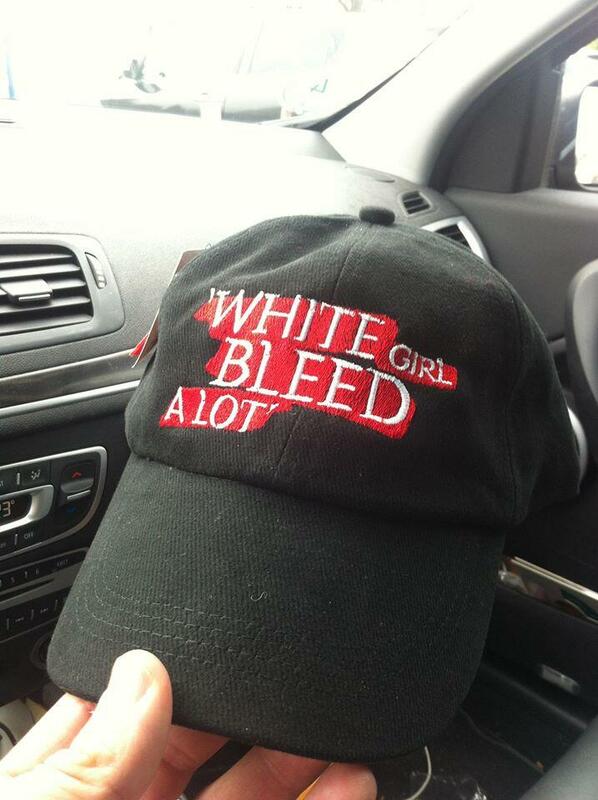 “White girl bleed a lot,” she said, laughing. “They were having such a good time,” said one of the victims, referring to the laughing and joking during violence. Sound familiar? The day after the White Girl Bleed a Lot attack, a few of the victims went to the police station to ask if their attackers were in jail. Police told them there was no report on their assault. It never happened. A few days and a few calls to talk radio later, the police chief and the mayor held a press conference, telling everyone how sorry they were for not taking the crime more seriously. They both however, denied race had anything to do with it. This attack came just a few weeks after the black holiday celebration in Milwaukee known at Juneteenth. News accounts are, at best, sketchy. But one year later, after another massive disturbance where 54 people were arrested as a helicopter kept tabs, witnesses recounted their experiences from 2011. My girlfriend and I walked up to Juneteenth last year from Riverwest; we got there right at the end. Anyways, on our walk back home, a half a dozen squad cars rushed past us and one squad car stopped. The officers were wearing full riot gear and said something to the likes of ‘What the hell are you (white) people doing in this neighborhood? Get the out **** of here, don’t you know there is a riot going on a block away? Just a few weeks after that, it happened again. This time at the bucolic Wisconsin State Fair in Milwaukee. There, hundreds of black people beat up white people, damaged their cars, hurled racial epithets, and caused chaos inside and outside the gates of the State Fair. Much of the panic and terror captured on 911 calls that were later released to the media. Groups of black people ran down the midway, pushing and beating people, stealing from vendors. It was complete chaos for two hours. Then it continued outside, where state police directed traffic while a race riot raged yards away. “They were attacking everybody for no reason whatsoever. It was 100% racial,” claimed Eric, an Iraq war veteran from St. Francis who says young people beat on his car. Outside of Milwaukee, people are always surprised when I ask if they knew that Milwaukee was a center of racial violence and media denial. Few know. But in Milwaukee, more and more people do. And despite a virtual media blackout on most of the cases of black mob violence, some people speak out. One is “Big Mike” Hagler, a video blogger who had just about all he can take from regular and frequent and intense black mob violence. “All people want to do is fight. Y’all acting like animals. And it is crazy to say it is our own people acting that way. It’s crazy when you go to an event and there be a majority white people there. As soon as black people come around that get to moving out of the way. They already know what is going to happen. “It is from a perfect storm of entitlements, political correctness, and white guilt where people are afraid to identify who are doing the crimes and why they are doing it. This was a PC response because it was black mob violence. You guys (fellow panelists) are in denial…. We have a real problem. A real sickness in the (black) community, that until we address it, it will continue to explode. Milwaukee and other major cities in this country are facing a crisis of mob violence this summer. And if the powers that be refuse to identify the problem, how can they expect to combat it? Two years later, Tim Bessette is asking the same question. And getting the same answer. 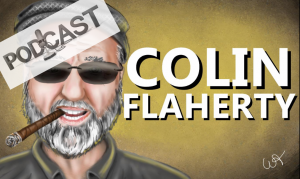 Black mob violence: Are there any reporters left in Milwaukee? 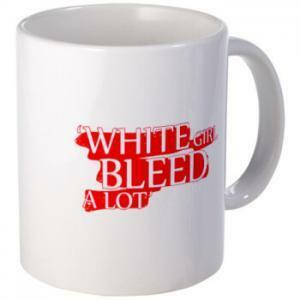 Wisconsin – White Girl Bleed a Lot, Knockout Game, black on white crime.